We depended on our family chore charts. They came in handy, from frosting a cake to giving the dog a bath. 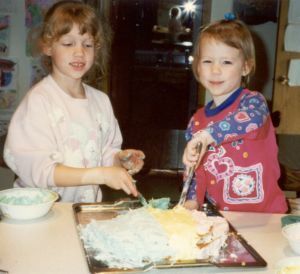 Emily and Annette still enjoy making birthday cakes for the family. Click on one of the Printable Chore Charts below. They're Free! There is one other simple chart that we like to use sometimes and it only takes a minute to prepare. The children like it because they help to create it and it's a nice change of pace. The children really like being a part of listing all those tasks. But then as Emily put it, "It's all downhill from there!" I guess she doesn't like actually doing the chores! Annette on the other hand, looks forward to completing the tasks. Because as she put it, "Crossing off is the most fun!" And cross off she does, sometimes with the most elaborate flair. For ideas of what to put on this list, see our Household Chores Checklist. Studies prove that families who work together stay together. 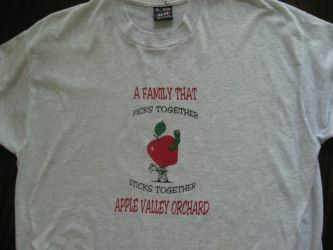 My mom and dad had an apple orchard when the children were little. Everyone got involved from picking to bagging and selling. A Family That Picks Together, Sticks Together! We still love getting together and doing things as a family! Mutual respect and cooperation seem to blossom when everyone has a common goal. 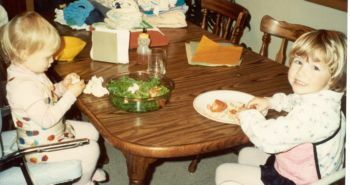 Emily and Laura are making salads for supper. It was the middle of winter and they insisted on wearing their swimsuits. We hope our simple family chore charts help you to get those jobs done!